Can you make ricotta out of mozzarella whey? The internet was a bit unclear on whether the whey from mozzarella can be used to make ricotta. But I decided to give it a try anyway. I'm no sure if this step is necessary since mozzarella whey is already acidified from the lemon juice, but I let the whey sit at room temperature overnight anyway. Then I brought the whey to a simmer just as I would when making any other kind of ricotta, strained out the liquids, and then let the solids drip in a bag of cheesecloth for a few hours. The result is ricotta much tastier than that which I got from chevre whey! 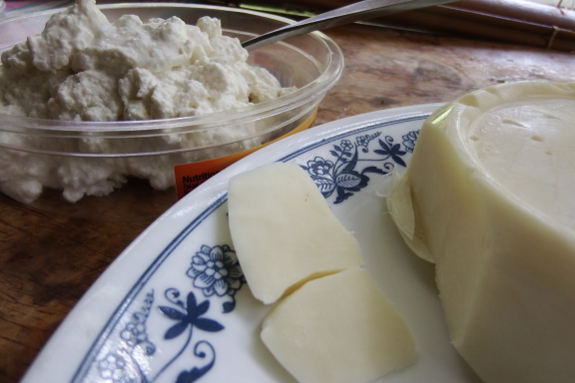 In fact, mozarella-offshoot ricotta is so tasty that I froze the mozzarella for later and set aside the ricotta as this week's cheese. It's delicious when added to sauteed summer squash right after you turn off the heat so the ricotta melts into the vegetables. And this ricotta is also a great addition to tomato-and-cucumber salad drizzled with a dressing of olive oil, balsamic vinegar, honey, salt, and pepper. Ricotta has now officially joined the ranks of my favorite cheeses! It looks fantastic. You are fast becoming an expert cheese maker! How long can you milk Abigail? Will you breed them both this fall?